The Making of a Great Newspaper: The Story of the New York Times. The New York Times Co., 1924. Until 1997, the New York Times was headquartered and printed its papers in a curious ch�teauesque structure at 229 West 43rd Street, a block from the 1904 skyscraper that gave its name to Times Square. The Annex Building took shape in three major stages of construction from 1913 to 1924. The first section was an 11-story structure at the east end of the site designed by Buchman & Fox that was engineered to anticipate upward expansion. The dignified design of limestone and terra cotta presented the appearance of a university club, but the interior was laid out as a true vertical factory that the Times proclaimed "the greatest and completest newspaper workshop in the world." The need for more space came rapidly. With daily circulation reaching 313,000 copies by 1921, the Times sought to double the plant's printing capacity. 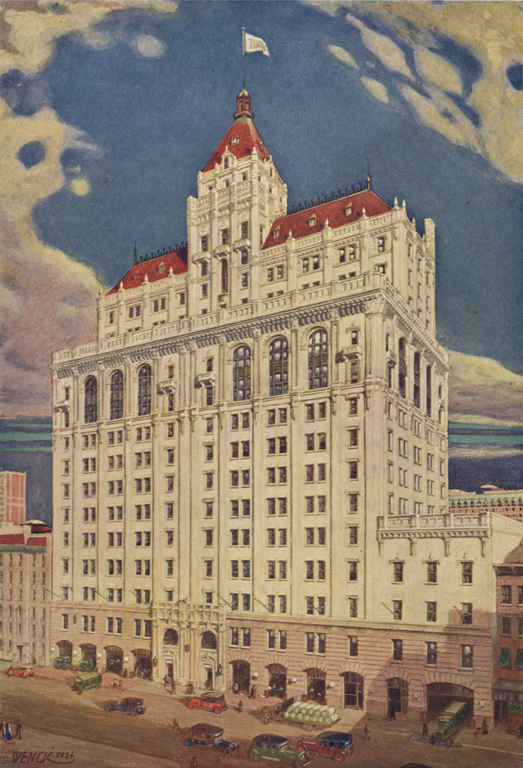 In 1922, architects Ludlow & Peabody designed a 100-foot extension on the west side-an 11-story addition on the west, a four-story "attic," and seven-story setback tower rising above the whole in the style of the French Renaissance, which like the Times Tower was ornamented with lavish confections of cream-colored glazed terra cotta. Like the first section of the Annex, the interior was carefully designed and engineered as a purpose-built factory that produced a continuous daily flow of news and newspapers. Every floor was occupied by the functions of the paper. In 1932, Detroit-based architect Albert Kahn added another west wing, and additions in 1947 by Shreve, Lamb, and Harmon that extended the Annex to 44th Street and expanded the overall building size by 61 percent. While many other newspapers moved printing operations to areas with cheaper rents, the Times continued publishing from the Annex until 1997, when they relocated their printing to a new plant in College Point, Queens. Today the 52-story New York Times Building on Eighth Avenue and 41st Street, designed by the Renzo Piano Building Workshop with FXFowle, completed in 2009, only houses the paper's white-collar workforce.